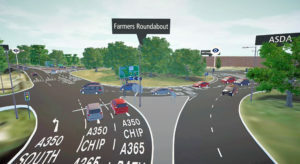 Work began this week to alter the layout and introduce traffic signals at Melksham’s Farmers Roundabout on the A350, which will be completed by October. An artist’s impression of what the roundabout will look like once the works are complete. Next week, the contractors who are carrying out the work, Dyer & Butler, are hosting a “meet the contractor” event on 11th February at Melksham Town Hall from 4pm until 7.30pm. Wiltshire Council says “The new traffic signals have been designed to mprove traffic flow and reduce queues and delays. The work should be completed by October 2019. “Wiltshire Council is working closely with its contractor Dyer & Butler to plan the sequence of construction work to minimise disruption – although there will be some delays while the work is carried out as traffic management and lane closures will be required. However, there will be no reduction in the number of lanes operating during peak hours. “A temporary 30mph speed limit will also be in place while works are going on, to help manage traffic. “Signs have been put up in the area including as far afield as the M4 junction 17 and the A350 Yarnbrook, to give plenty of notice to long distance motorists, and the opportunity for them to change their route choice should they wish to. “North of Farmers Roundabout to A365 junction – summer to early autumn 2019 “Completion of works – October 2019. “As part of the works, improvements to the appearance of the area will take place including clearing vegetation, removing weeds and obstructive foliage, sign maintenance and general cleaning. There will also be revised signing and lining, drainage improvements and extensive resurfacing works. Wiltshire Council cabinet member for highways, Bridget Wayman said, “We are committed to improving Wiltshire’s roads. This roundabout and route in Melksham suffers from traffic congestion, particularly during the peak periods and forms part of the key A350 route linking the M4 with the South of England. “These much-needed improvements will result in better traffic flow and a more accessible town and this in turn will have a positive impact on the local economy. Wiltshire Council continued, “The total scheme is anticipated to cost around £3million and is largely being provided through the Department for Transport’s National Productivity Investment Funding (NPIF), following a successful Wiltshire Council bid.